A spinal cord injury is a devastating loss even in the best circumstances. Often times the best you can hope for is re-learning to move, walk, and breathe on your own. But in many cases, survival rates are low. Afterwards, there can be ongoing challenges including respiratory infections and poor muscle tone. A spinal cord injury means life must change. According to the Christopher and Dana Reeve Foundation, the costs of recovering from such an injury are astronomical. SCI injury survivors with high tetraplegia can expect to spend more than a million dollars in the first year alone. In an increasingly aggressive legal climate, it's common to hear complaints about frivolous lawsuits and demands for tort reform. Suing is not easy, though, and research suggests that 97% of medical malpractice claims do have merit. Considering a spinal cord injury lawsuit does not make you greedy. Indeed, it may be a necessity if you want to be able to cover the medical expenses for something that was beyond your control. 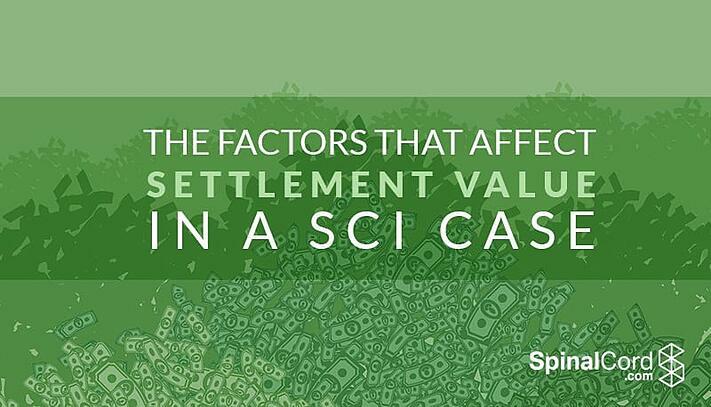 Many spinal cord injury lawsuits settle, and a number of factors affect the a SCI settlement value. Your injury lawyer is your best source of information about how much your case is worth, but here are some general guidelines. The severity of your injuries plays a significant role in the value of your settlement. Plaintiffs who suffer serious or life-threatening injuries are far more likely to get large settlements, especially when compared to people who retain all movement or who make spontaneous recoveries. With more severe injuries, your eligibility for pain and suffering-related damages typically climbs higher. When you sue for a spinal cord injury, you're not just suing for your pain and suffering, or your medical bills. You can also sue for lost earning potential and the loss of your ability to provide for your family. More severe injuries more significantly inhibit your earning power, increasing the potential value of a settlement. One of the primary purposes of a lawsuit is to recover your out-of-pocket expenses, while funding those that have not yet occurred. For this reason, the current value of your medical expenses, as well as the future medical costs you are likely to incur, are key in the settlement negotiation process. In many spinal cord injury cases, medical bills constitute the bulk of a settlement or jury award, so high medical bills, as well as severe injuries that make costly future bills likely, both increase your case's value. The primary benefit--to both you and the other party—of settling your case is that settling helps you avoid the uncertainties and costs of going to trial. For this reason, the other party will have a stronger incentive to settle the case if your evidence is strong. Say you're suing a recreational facility for a million dollars. That facility is unlikely to shell out such a huge sum if you can't even prove that the facility was the proximate cause of your injuries. Conversely, if you have an avalanche of undisputed evidence, the other party might be afraid of being harshly penalized by the jury, thereby giving them a strong incentive to settle—even for a large sum. Like it or not, the person the patient is now and was before the injury matters in court. When determining whether to settle, the other party will assess how sympathetic the jury is likely to feel toward the injured patient, how believable the testimony is, and how tragic the injuries will seem to outsiders. The defendant's lawyer will be interested in crafting a narrative that emphasizes the loss to the injured patient, society, and their family resulting from the injury. The more compelling that narrative is, and the more damage of any sort the patient has encountered, the more likely they will be to get a large award at trial. That translates into a significantly higher likelihood of a large settlement offer. Younger plaintiffs can typically expect to get higher settlements, since they have more years of life ahead of them and therefore more medical bills. A longer life span also means that the injury has been a greater loss. After all, is depriving you of 5 years or 40 years of physical activity more damaging? Likewise, juries may look at overall health when deciding a case. A young person who was in excellent health may have lost more than an older person whose health was already deteriorating. Defense lawyers are keenly aware of this fact. For this reason, they sometimes offer young, healthy plaintiffs higher settlements. One of the primary benefits to defendants of settling cases is that it protects their reputation. They can seek a sealed settlement, and avoid a long and ugly courtroom battle that gets them nothing but bad press. For this reason, the more damaging your case might be to the other side's reputation, the more compelled the defendant will be to settle. A doctor whose negligence caused paralysis, for example, generally has a much stronger incentive to settle if there is evidence that he or she made the same mistake before. Many plaintiffs are surprised to learn that facts, evidence, and eyewitness testimony don't come into play until relatively late in the SCI lawsuit process. Early on, your lawyer and the other side will fight about jurisdictional issues, legal precedent, and your eligibility for certain types of damages. If there are legal issues in contention—such as whether your case was filed within the statute of limitations, or the possibility that the defendant is entitled to some form of immunity—you might not get a settlement offer until the lawyers in the case have submitted a number of motions. This process can take anywhere from a few months to several years, and its length is partially dependent on the complexity of your case and the amount of evidence involved. When the law is clearly on your side, as well as when the judge has repeatedly ruled in your favor on issues that were in contention, the other party is more likely to award a high settlement value in a spinal cord injury case. 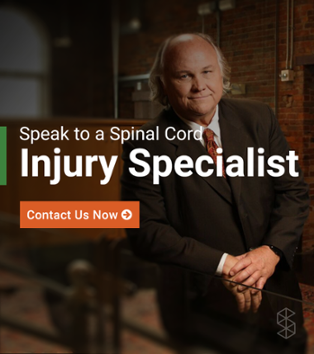 To find out more about the basics of spinal cord injury lawsuits, click the button below to download our free injury law guide.